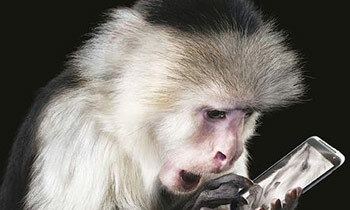 A monkey had run away with a mobile phone of British woman today, the Anuradhapura Police said. They said that the 26-year-old British woman had lodged a complaint today. The Police said the woman was working as a trainee nurse at the Anuradhapura Teaching Hospital after following a nurses training course in UK. According to the Police complaint, she had said she was temporally residing at a lodge in Anuradhapura and a troupe of monkeys broke into her room and taken her Rs.50,000 worth mobile phone. She said that he went behind the troupe of monkeys in the hope of retrieving the phone but could not, and following which she had lodged a complaint with the Police. SIMPLE, DIAL THAT NUMBER , AND FOLLOW THE SOUND OF RING TONE. Probably it is in the second hand market in Anuradhapura. The monkeys started this whole stealing business.They are a very clever lot. Always looking for a good deal ! ACTUALLY THAT HAD HAPPENED IN ARIZONA OR SOMEWHERE , A PARROT HAD ANSWERED A LAND PHONE. ... NICE ONE. Throw a few old non-working mobile phones at the troop and if this lady is lucky, the monkey will throw back the phone he stole. Common sense solution! But, do not be surprised if the monkey answers the call!! !